A KAKURO puzzle is constructed on a crossword grid just like a standard crossword, but the digits 1 to 9 are used instead of the letters of the alpahabet. 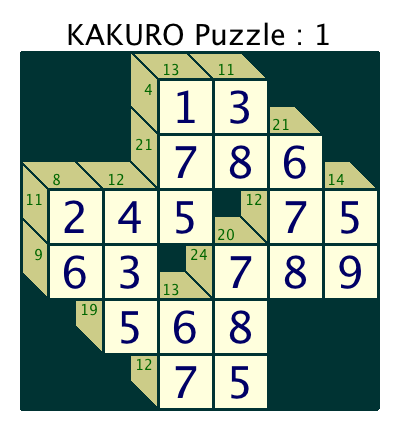 In a standard Kakuro puzzle, the Across and Down clues are simply the sums of the digits in the across and down words. A variant of this standard is to use the products of the digits for the clues. Crossword Express will make both of these variants. 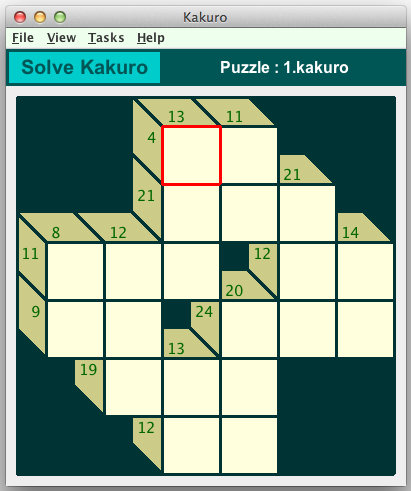 The following graphics show a Kakuro puzzle in the Crossword Express Solve screen and a PNG graphic file produced by the program's print function, showing the complete puzzle solution. See also a full size version of a PDF file showing the solution. Puzzles may be built in both add and multiply mode.